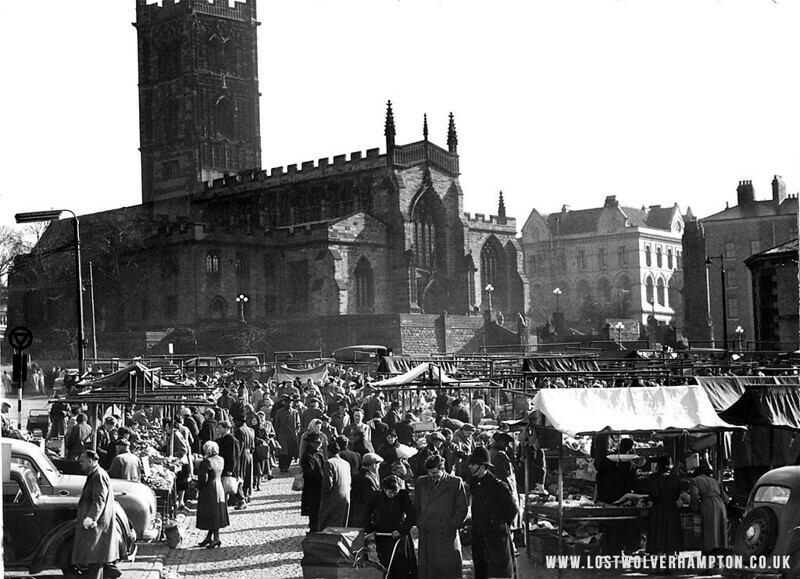 Frontpage › Forum › People & Places of Wolverhampton › "MARKET DAY MEMORIES"
This topic contains 2 replies, has 1 voice, and was last updated by Billy 3 years, 9 months ago. The ring road cut a swathe through it in the 1970’s, and since then, the University, the Civic Centre and the Wolves Football Club have devoured the rest. But there are still many old Wulfrunians out there who still recall the nostalgic days of the 1950’s and those early Saturday mornings, being dragged up to the old market patch on St Peters, as mother made her regular visit to save a few pence on a bit of cheap veg….. It was with the markets move from its old position in St Peter’s Square to its new site in School Street on Brickkiln Patch that the symbolism of new beginnings would apply. We didn’t realise then that new beginning affected not just the markets but the entire area including the local community once housed around North Street, and the town itself with the loss of many old world buildings such as the Arcades, The old Coaching Inns, etc.. The new markets were newer and smarter but they lacked the energetic atmosphere of the old with the aromas of its fruit and vegetables and its flower stalls. The cheerful shouts of its traders was and still is sadly missed by many. Turbans used to be the mode of head dress for the flower sellers in the 1940’s and it was open baskets carried by the lady shoppers 50 years ago no plastic bags then. I am sure you will know, when did the old market finish next to St Peters and the move to the new site in School Street / Market Square? The new retail market pictured here in 1961, shortly after it was opened by Lord Morrison of Lambeth. The Wolverhampton Chronicle termed the new market as a half a million pound gamble; the modern facility had cost around £508,000 . Wolverhampton punters described it as to flashy for the town but eventually it came to be accepted as part of Wolverhampton’s shopping area. The outdoor stalls with their brightly striped awnings fell short of modern standards however and seven years later. 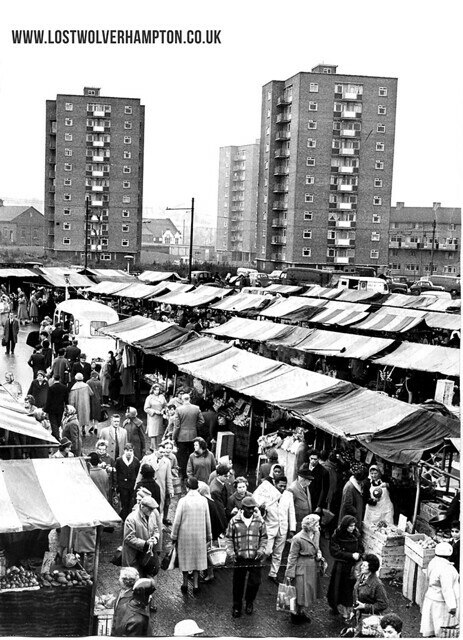 the market was moved temporarily across on to Bennetts Fold car-park whilst permanent concrete stalls were constructed. It had been hoped that the site of the old Retail Market and patch would be retained as an open space, but after being used for a car parking space for a few years. The Civic Centre was constructed and opened there in the late 1970’s. I have a framed print of it too Says Andy Lockett- Who enquires has anyone any details about the artist & when it was painted ? The painting was taken from this photograph from my collection of the Market Patch in the 1950′, albeit with a little poetic licence. 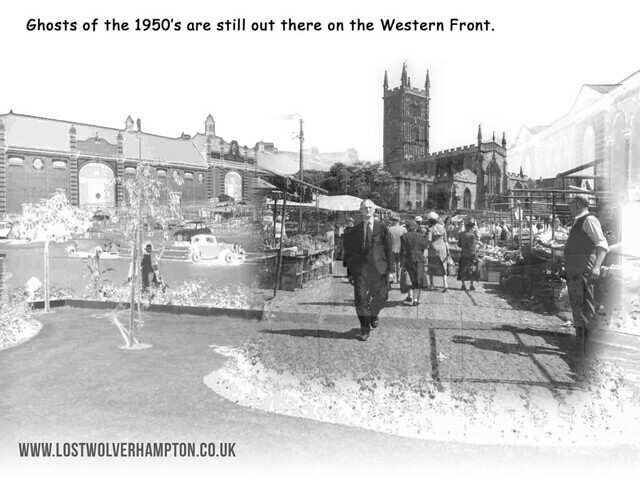 More information on the old Markets can be obtained from me on Lost Wolverhampton.